Sonia Gandhi pronunciation (help·info) (née Maino; born 9 December 1946) is an Indian politician. She is a former president of the Indian National Congress, the secular and left-of-centre political party, which governed India for most of its post-independence history. She took over as the party leader in 1998, seven years after the assassination of her husband, Rajiv Gandhi, a former prime minister of India, and remained in office for nineteen years. Born in a small village near Vicenza, Italy, Gandhi was raised in a Roman Catholic family. After completing her primary education at local schools, she moved for her higher education to Cambridge, England, where she met Rajiv Gandhi, and later married him in 1968. She took up Indian citizenship and began living with her mother-in-law, the then-Prime Minister of India, Indira Gandhi, at the latter's New Delhi residence. Sonia Gandhi, however, kept away from the public sphere, even during the years of her husband's premiership. Sonia Maino was born on 9 December 1946 to Stefano and Paola Maino in Lusiana (in Maini street), a historically Cimbrian-speaking village about 35 km from Vicenza in Veneto, Italy. Sonia spent her adolescence in Orbassano, a town near Turin, and was raised in a traditional Roman Catholic Christian family. She attained primary education attending the local Catholic schools; Sister Maria, one of her early teachers described her as "a diligent little girl, [who] studied as much as was necessary". Stefano, who was a building mason established a small construction business in Orbassano. He had fought against the Soviet military alongside Hitler's Wehrmacht on the eastern front in World War II, was a loyal supporter of Benito Mussolini and Italy's National Fascist Party. The family house had leather bound books on writings and speeches of Mussolini. Stefano had named Sonia and her elder sister Nadia in the memory of the Italian participation in the Eastern Front. He died in 1983. Gandhi has two sisters who still reside in Orbassano along with their mother. Gandhi completed her schooling at the age of 13; her final report card read: "intelligent, diligent, committed [...] would succeed well at the high school for teachers". She aspired to become a flight attendant. In 1964, she went to study English at the Bell Educational Trust's language school in the city of Cambridge. The following year, she met Rajiv Gandhi at the Varsity Restaurant, where she was working as a part-time waitress, while he was enrolled for an engineering degree in the Trinity College at the University of Cambridge. In this context, the Times, London reported, "Mrs Gandhi was an 18-year-old student at a small language college in Cambridge in 1965, [...] when she met a handsome young engineering student". The couple married in 1968, in a Hindu ceremony, following which she moved into the house of her mother-in-law and then Prime Minister, Indira Gandhi. The couple had two children, Rahul Gandhi (born 1970) and Priyanka Vadra (born 1972). Despite belonging to the influential Nehru family, Sonia and Rajiv avoided all involvement in politics. Rajiv worked as an airline pilot while Sonia took care of her family. She spent considerable amount of time with her mother-in-law, Indira Gandhi; she recalled her experience in a 1985 interview with the Hindi-language magazine Dharmyug, "She [Indira] showered me with all her affection and love". Soon after the latter's ousting from office in 1977 in the aftermath of the Indian Emergency, the Rajiv family contemplated to move abroad for a short time. When Rajiv entered politics in 1982 after the death of his younger brother Sanjay Gandhi in a plane crash on 23 June 1980, Sonia continued to focus on her family and avoided all contact with the public. Sonia Gandhi's involvement with Indian public life began after the assassination of her mother-in-law and her husband's election as prime minister. As the prime minister's wife she acted as his official hostess and also accompanied him on a number of state visits. In 1984, she actively campaigned against her husband's sister-in-law Maneka Gandhi who was running against Rajiv in Amethi. At the end of Rajiv Gandhi's five years in office, the Bofors scandal broke out. Ottavio Quattrocchi, an Italian businessman believed to be involved, was said to be a friend of Sonia Gandhi, having access to the Prime Minister's official residence. The BJP has alleged that she appeared on the voters' list in New Delhi prior to obtaining Indian citizenship in April 1983, in contravention of Indian law. Former senior Congress leader and former President of India Pranab Mukherjee said that she surrendered her Italian passport to the Italian Embassy on 27 April 1983. Italian nationality law did not permit dual nationality until 1992. So, by acquiring Indian citizenship in 1983, she would automatically have lost Italian citizenship. Sonia Gandhi as Leader of Opposition, meeting with the President of Russia Vladimir Putin during latter's State visit to India in October 2000. After Rajiv Gandhi was assassinated in 1991 and Sonia Gandhi refused to become Prime Minister, the party settled on the choice of P. V. Narasimha Rao who became leader and subsequently Prime Minister. Over the next few years, however, the Congress fortunes continued to dwindle and it lost the 1996 elections. Several senior leaders such as Madhavrao Sindhia, Rajesh Pilot, Narayan Dutt Tiwari, Arjun Singh, Mamata Banerjee, G. K. Moopanar, P. Chidambaram and Jayanthi Natarajan were in open revolt against incumbent President Sitaram Kesri and many of whom quit the party, splitting the Congress into many factions. Within 62 days of joining as a primary member, she was offered the party President post which she accepted. She contested Lok Sabha elections from Bellary, Karnataka and Amethi, Uttar Pradesh in 1999. She won both seats but chose to represent Amethi. In Bellary, she had defeated veteran BJP leader, Sushma Swaraj. She was elected the Leader of the Opposition of the 13th Lok Sabha in 1999. When the BJP-led NDA formed a government under Atal Bihari Vajpayee, she took the office of the Leader of Opposition. As Leader of Opposition, she called a no-confidence motion against the NDA government led by Vajpayee in 2003. In the 2004 general elections, Gandhi launched a nationwide campaign, criss-crossing the country on the Aam Aadmi (ordinary man) slogan in contrast to the 'India Shining' slogan of the BJP-led National Democratic Alliance (NDA) alliance. She countered the BJP asking "Who is India Shining for?". In the election, she was re-elected by a 200,000-vote margin over nearest rival, in the Rae Bareli. Following the unexpected defeat of the NDA, she was widely expected to be the next Prime Minister of India. On 16 May, she was unanimously chosen to lead a 15-party coalition government with the support of the left, which was subsequently named the United Progressive Alliance (UPA). The defeated NDA protested once again her 'foreign origin' and senior NDA leader Sushma Swaraj threatened to shave her head and "sleep on the ground", among other things, should Sonia become prime minister. The NDA claimed that there were legal reasons that barred her from the Prime Minister's post. They pointed, in particular, to Section 5 of the Indian Citizenship Act of 1955, which they claimed implied 'reciprocity'. This was contested by others and eventually the suits were dismissed by the Supreme Court of India. A few days after the election, Gandhi recommended Manmohan Singh as her choice as prime minister, that the party leaders accepted. Her supporters compared it to the old Indian tradition of renunciation, while her opponents attacked it as a political stunt. Sonia Gandhi with 13th President of India Pranab Mukherjee on releasing the first day cover of INS Vikramaditya in 2013. On 23 March 2006, Gandhi announced her resignation from the Lok Sabha and also as chairperson of the National Advisory Council under the office-of-profit controversy and the speculation that the government was planning to bring an ordinance to exempt the post of chairperson of National Advisory Council from the purview of office of profit. She was re-elected from her constituency Rae Bareli in May 2006 by a margin of over 400,000 votes. As chairperson of the National Advisory Committee and the UPA, she played an important role in making the National Rural Employment Guarantee Scheme and the Right to Information Act into law. She addressed the United Nations on 2 October 2007, Mahatma Gandhi's birth anniversary which is observed as the international day of non-violence after a UN resolution passed on 15 July 2007. Under her leadership, the Congress-led UPA won a decisive majority in the 2009 general elections with Manmohan Singh as the Prime Minister. The Congress itself won 206 Lok Sabha seats, which was then the highest total by any party since 1991. She was re-elected to a third term as a member of parliament representing Rae Bareli. In 2013, Gandhi became the first person to serve as Congress President for 15 years consecutively. In the same year, Gandhi condemned the Supreme Court's judgement supporting Section 377 of the Indian Penal Code and backed LGBT rights. In the 2014 general election, she held her seat in Rae Bareli. However, the Indian National Congress and the Congress-led UPA electoral alliance suffered their worst result in a general election ever, winning only 44 and 59 seats respectively. When Rahul Gandhi was expected to take over as Congress president, Communist Party of India (Marxist) leader Sitaram Yechury picked Sonia over Rahul, calling her the "glue that binds the opposition" during an interview November 2017 . Rahul took over as the 49th Congress president on 16 December 2017. Gandhi returned to active politics for Indian National Congress' campaign for the Karnataka Legislative Assembly election, 2018. Having stayed away from campaigning for elections since 2016, Gandhi addressed a rally at Bijapur, which comprised five legislation assembly constituencies; while Congress emerged as the second largest party in the election with 78 seats behind the BJP, the former won four or the five assembly seats from Bijapur. Gandhi also played an active role in orchestrating a post-poll alliance with the Janata Dal (Secular). Sonia is the widow of Rajiv Gandhi, elder son of Indira Gandhi. Sonia has two children, Rahul and Priyanka Gandhi. In August 2011, she underwent successful surgery for cervical cancer in the United States at Memorial Sloan–Kettering Cancer Center in New York. She returned to India on 9 September after her treatment. Speaking on 18 July 2012, about her son taking a larger role in the party, she said that it is for Rahul to decide. Sonia Gandhi was listed as one of the fifty best-dressed over 50s by the Guardian in March 2013. She follows the style quote "Simple is Stylish" and looks no further than mother-in-law Indira Gandhi's "innate sense of fashion". According to an affidavit filed during the Indian general election, 2014, Sonia had declared assets worth ₹ 92.8 million – ₹ 28.1 million in movable and ₹ 64.7 million in immovable properties. This is an almost six-fold increase since her declaration in the last election. Gandhi was seen as the most powerful politician of India from 2004 - 2014, and variously listed among the most powerful people and women listings by magazines. In 2013, Sonia Gandhi was ranked 21st among world's most powerful and 9th most powerful woman by Forbes Magazine. In 2007, she had been named the third most powerful woman in the world by the same magazine and was ranked 6th in exclusive list in 2007. In 2010, Gandhi ranked as the ninth most powerful person on the planet by Forbes magazine. She was ranked 12 in 2012 in Forbes' powerful people list. Sonia was also named among the Time 100 most influential people in the world for the years 2007 and 2008. New Statesman listed Sonia Gandhi at number 29 in their annual survey of "The World's 50 Most Influential Figures" in the year 2010. ^ Sources describing Gandhi's initial reluctance and eventual election. ^ Sources describing Gandhi's leadership of the UPA and declining the premiership. ^ Sources discussing the welfare schemes and controversies. ^ Sources discussing the listing. ^ a b c "Profile: Sonia Gandhi". BBC News. 16 May 2014. Retrieved 21 May 2018. ^ Naqshbandi, Aurangzeb (16 December 2017). "Sonia Gandhi's 19 years as Congress president: From husband Rajiv's death to son Rahul's elevation". Hindustan Times. Retrieved 20 December 2017. ^ Weinraub, Bernard (24 May 1991). "Assassination In India; Sonia Gandhi Declines Invitation To Assume Husband's Party Post". The New York Times. Retrieved 25 May 2014. ^ "Sonia Gandhi re-elected Congress President". Outlook. 25 March 2005. Retrieved 21 November 2017. ^ a b "Sonia Gandhi Biography". Elections in India. Retrieved 24 May 2014. ^ "Fourth time in a row, Sonia Gandhi is Congress chief". The Times of India. 4 September 2010. Retrieved 25 May 2014. ^ Robinson, Simon. "India's Most Influential". Time. Retrieved 25 November 2017. ^ "Sonia: and yet so far". The Economist. 20 May 2004. Retrieved 25 November 2017. ^ Roy, Aruna (15 December 2017). "Movements and governments". The Indian Express. Retrieved 15 December 2017. ^ "End of the longest regency". Outlook. 4 December 2017. Retrieved 25 November 2017. ^ a b Religioscope: India: politics of renunciation, traditional and modern – Analysis Archived 16 August 2016 at the Wayback Machine; retrieved 9 December 2011. ^ Ramaseshan, Radhika (30 August 2002). "BJP sees Gujarat ammo in Sonia origins". The Telegraph. Calcutta, India. Retrieved 2 February 2010. ^ Manoj, CL (13 October 2017). "The Sonia Gandhi years and what Rahul Gandhi can learn". The Times of India. Retrieved 25 November 2017. ^ a b Riedel, Bruce (24 June 2012). "Sonia Gandhi Health Mystery Sets India Leadership Adrift". The Daily Beast. Retrieved 25 November 2017. ^ Richard Sandbrook; Ali Burak Güven (1 June 2014). Civilizing Globalization, Revised and Expanded Edition: A Survival Guide. SUNY Press. pp. 77–. ISBN 978-1-4384-5209-8. ^ a b c d Schiavazzi, Vera (17 January 2005). "Sonia Gandhi: The Maino girl who kept her tryst with destiny in India". India Today. Retrieved 19 November 2017. ^ "Pictures from the book-biography "The Red sari" by Javier Moro". Radio Popolare. Archived from the original on 28 July 2011. Retrieved 9 December 2011. ^ "Sonia Gandhi, dalla piccola Lusiana all'India ecco il romanzo di una donna speciale". Il Giornale di Vicenza. 5 October 2009. Archived from the original on 14 June 2011. ^ a b Laiq, Jawid (23 February 1998). "Meeting Mr Maino". Outlook. Archived from the original on 26 April 2014. Retrieved 19 July 2013. ^ In Maino land Archived 8 March 2013 at the Wayback Machine; retrieved 23 March 2007. ^ Italy heralds 'first woman PM' Archived 6 March 2016 at the Wayback Machine; retrieved 18 July 2007. ^ Perry, Alex (17 May 2004). "The Sonia Shock". Time. Archived from the original on 4 June 2011. Retrieved 12 June 2009. ^ "News Features". Catholic Culture. 20 November 2001. Retrieved 11 March 2014. ^ Hazarika, Sanjoy (23 May 1991). "Assassination In India: Woman in the News; The Tragedy's New Player; Sonia Gandhi". New York Times. Retrieved 1 March 2018. ^ Ramachandran, Aarthi. Decoding Rahul Gandhi. p. 1973. Retrieved 27 May 2014. ^ Venkatesan, V. (5 June 1999). "Citizen Sonia". Frontline. Retrieved 30 May 2014. ^ Rasheeda Bhagat. "Sonia Gandhi: Ordinary Italian to powerful Indian". Thehindubusinessline.com. Retrieved 11 March 2014. ^ Who is Quattrocchi? Archived 23 April 2016 at the Wayback Machine Retrieved 23 March 2007. ^ "BJP accuses Sonia of flouting law". The Indian Express. 12 May 1999. Retrieved 12 April 2011. ^ a b Venkatesan, V (June 1999). "Citizen Sonia". Frontline. 16 (12). Archived from the original on 22 April 2011. Retrieved 12 December 2011. ^ "Citizenship: How to lose it?". Trentini Nel Mondo. Archived from the original on 7 January 2012. Retrieved 2 February 2010. ^ "The Sitaram Kesri case: How dynasty trumped ethics | Latest News & Updates at". Daily News & Analysis. 10 July 2011. Retrieved 30 May 2014. ^ "Sonia Gandhi re-elected Congress president, unopposed". NDTV. 3 September 2010. Retrieved 30 May 2014. ^ "India's Congress Party rallies for Sonia Gandhi". CNN. 17 May 1999. Retrieved 2 February 2010. ^ "Sonia Gandhi Biography – about, family and professional history, political journey and awards won". Elections.in. Retrieved 11 March 2014. ^ "A Congress bastion since 1952". The Hindu. 28 February 2004. Retrieved 24 May 2014. ^ "General election 1999, Candidate wise result". Election Commission of India. Retrieved 26 March 2012. ^ "Detailed Profile – Smt. Sonia Gandhi – Members of Parliament (Lok Sabha)". Archive.india.gov.in. Retrieved 11 March 2014. ^ "LS to witness 26th no-confidence motion in its history". The Times of India. 17 August 2003. Retrieved 30 May 2014. ^ "Statistical Report on General Elections, 2004 to the 14th Lok Sabha" (PDF). ECI. p. 308. Retrieved 24 May 2014. ^ Pioneer News Service. "Whose inner voice?". CMYK Multimedia Pvt. Ltd. Archived from the original on 9 April 2007. Retrieved 20 July 2007. ^ "Sonia is Indian, rules SC". The Times of India. 13 September 2001. Retrieved 26 May 2014. ^ "Indian press lauds Gandhi decision". BBC. 19 May 2004. Retrieved 6 February 2008. ^ "Profile: Sonia Gandhi". BBC. 23 March 2006. Retrieved 6 July 2008. ^ "'Hurt' Sonia quits as MP, chairperson of NAC". Retrieved 23 March 2006. ^ "Rae Bareli Lok Sabha". Elections.in. Retrieved 21 May 2014. ^ "Sonia strides to victory with record margin". Rediff. 11 May 2006. ^ Employment Bill not a populist measure: Sonia Archived 7 March 2016 at the Wayback Machine; retrieved 13 July 2007. ^ After RTI success, it's right to work Archived 7 December 2013 at the Wayback Machine; retrieved 13 July 2007. ^ "Sonia Gandhi raises disarmament issue at UN meet". The Times of India. 2 October 2007. Retrieved 2 October 2007. ^ "India's new government sworn in". BBC News. 22 May 2009. Retrieved 24 May 2014. ^ "Hail to the chief: Sonia spurs Cong to new heights". Hindustan Times. 11 March 2013. Archived from the original on 25 May 2014. Retrieved 24 May 2014. ^ "List of Winning candidates Final" (PDF). Election Commission of India. p. 8. Retrieved 26 March 2012. ^ "Sonia Gandhi completes 15 years as Congress president". Livemint. 13 March 2013. Retrieved 25 May 2014. ^ "Disappointed over court ruling on gay rights: Sonia Gandhi". Retrieved 12 December 2013. ^ "Sonia Gandhi wins by over 3.52 lakh votes". The Indian Express. 16 May 2014. Retrieved 24 May 2014. ^ "After its worst defeat ever in Lok Sabha elections, what can Congress do to recover?". Daily News & Analysis. 19 May 2014. Retrieved 21 May 2014. ^ "The worst defeat: Where the Congress went wrong". IBN Live. 17 May 2014. Retrieved 21 May 2014. ^ "Results". NDTV. Retrieved 21 May 2014. ^ "Sonia glue that keeps Oppn united; Rahul Gandhi will break it, Sitaram Yechury forecasts doom and gloom for BJP rivals". Financial Express. 12 November 2017. Retrieved 12 November 2017. ^ "Rahul Gandhi takes over as Congress president". 16 December 2017. Retrieved 12 November 2017. ^ "Rahul Gandhi Takes Over As Congress Chief; New Start, Say Party Leaders". NDTV. 16 December 2017. Retrieved 16 December 2017. ^ "Sonia Gandhi hits campaign trail, crosses swords with PM Modi in Karnataka". Livemint. 17 May 2018. Retrieved 8 May 2018. ^ "Sonia Gandhi meeting had more strike rate". Deccan Chronicle. 17 May 2018. Retrieved 17 May 2018. ^ Sethi, Aman (16 May 2018). "Karnataka Election: How Deve Gowda Learnt To Stop Worrying And Trust The Congress (Again)". The Huffington Post. Retrieved 17 May 2018. ^ "Sonia diagnosed with cervical cancer". Deccan Herald. Retrieved 12 December 2017. ^ "Sonia returns after surgery", Indian Express (9 September 2011); retrieved 12 July 2017. ^ "It's for Rahul to decide: Sonia". The Hindu. Chennai, India. 18 July 2012. ^ "Simple is stylish: Sonia". telegraph India. 8 November 2012. Retrieved 9 November 2012. ^ "Sonia Gandhi files papers, shows six-fold hike in assets". The Times of India. ^ Manoj, CL (13 October 2017). "The Sonia Gandhi years and what Rahul Gandhi can learn". The Times of India. Retrieved 25 November 2017. Gandhi had to struggle for years before steering the party back to power in 2004, for a 10-year stint when she became India’s most powerful politician. ^ "Sonia Gandhi third most powerful woman in Forbes list". hindustantimes.com. Retrieved 22 June 2017. ^ "The World's 100 Most Powerful Women". Forbes. 20 August 2004. Retrieved 30 May 2014. ^ "Sonia Gandhi in Forbes' list for 2007". Forbes. 30 August 2007. Retrieved 31 August 2007. ^ In Maino land Archived 6 November 2010 at the Wayback Machine; retrieved 23 March 2010. ^ "Ratan Tata, Sonia Gandhi in Forbes' powerful list". Business Today. New Delhi, India. 4 November 2010. Retrieved 23 April 2017. ^ "Sonia Gandhi, Tata in Forbes' most powerful people list". Times of India. Boston, Massachusetts. 4 November 2010. Retrieved 23 April 2017. ^ "Sonia Gandhi world's third most powerful woman: Forbes". NDTV.com. 30 October 2013. ^ Saritha Rai. "Sonia Gandhi". Forbes. ^ "These are the world's most powerful people, Photo Gallery". NDTV.com. ^ Sonia Gandhi among Time's 100 for 2007 Archived 3 August 2013 at the Wayback Machine; retrieved 14 May 2007. ^ Sonia Gandhi among Time's 100 for 2008 Archived 22 August 2013 at the Wayback Machine; retrieved 1 May 2008. ^ "Sonia Gandhi – 50 People Who Matter 2010". New Statesman. Retrieved 4 October 2010. ^ M. R. Venkatesh (6 September 2008). "Madras University honours Manmohan, Sonia". Chennai: Hindustan Times. Archived from the original on 5 July 2013. Retrieved 5 July 2013. ^ a b "Belgium honours Sonia Gandhi". Daily News and Analysis. India. Retrieved 9 June 2011. ^ "Belgium to honour Sonia Gandhi". Hindustan Times. India. Retrieved 5 November 2018. ^ "Sonia Gandhi: Vrije Universiteit Brussel". Vrije Universiteit Brussel . India. Retrieved 5 November 2018. ^ "Arbiter at the Gates | Sheela Reddy". Outlookindia.com. Retrieved 11 March 2014. 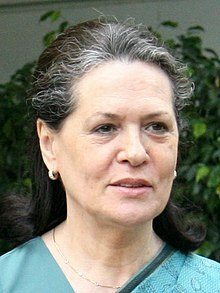 Wikimedia Commons has media related to Sonia Gandhi.